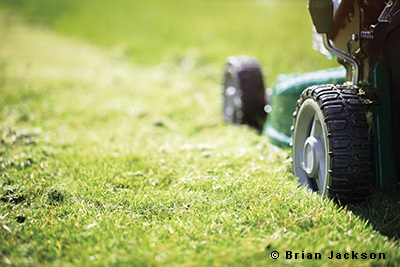 Over the past 15 years, Extreme How-To has been asked for a lot of lawn-care advice. In this article we’ve compiled our most frequently asked questions, along with answers from lawn-care experts, to give you a grab-and-go primer for preparing your lawn for the green season. When should I begin feeding my lawn for spring? Winter is like a long slumber for lawns, and in the spring they wake up hungry. Fertilizing your lawn in the early spring (February to April) strengthens the root system and gives the grass a healthy start before the heavy growing season. If you see crabgrass, apply a combination fertilizer with a pre-emergent selective herbicide to control it. In late spring (April to June), the grass is busy growing and using up stored energy, which requires a fertilizer designed for this time of year. However, broadleaf weeds are growing as well, so use a combination of fertilizer with broadleaf weed control (a “weed-n-feed” product). Feeding your lawn just once a year will improve its condition, but feeding it four times a year on a regular schedule will make it even healthier. What is the best practice for seeding a lawn? Two things are important when seeding: quantity and coverage. You want to use plenty of seed. For a brand new lawn, 6 to 8 pounds per 1,000 square feet is not excessive. For an existing lawn that you want to “thicken up,” 3 or 4 pounds per 1,000 feet should be plenty. Over-seeding can flesh out bald or thin spots of the lawn. Check the seed package or ask your local professional for specific instructions. Spread the seed in a criss-cross pattern, using some sort of seed-spreading device to achieve even coverage. Spreading seed by hand does a lousy job. Using a dedicated seed spreader—even an inexpensive handheld model—will get better results. Prior to spreading the seed, remove all loose thatch and lawn debris and work the soil of bare spots and thin areas to a depth of 1/4 to 1/2 inch. This can be done with any sharp garden tool or rake. This may not be necessary if you’ve used an aerator. But if you haven’t, then cultivating the soil gives the seed a place to lodge. Then, after spreading the seed, use a rake to work the seed just below the surface of the soil. This also helps break up any soil cores the aerator has left on the lawn. Next, spread fertilizer. Some products are available as a mixture of seed and fertilizer. 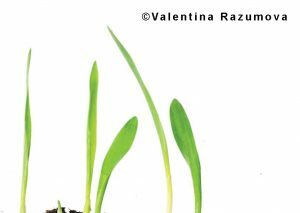 Otherwise, follow the seed with a good “starter” fertilizer with a high middle number (phosphorous), such as 20-27-5 (most common starter analysis found at retail). Keep the new seeds moist. How often should I water the lawn after planting grass seed? During the germination period, water your lawn twice a day, 10 minutes per watered area. The idea is to keep the top 1 inch of soil moist, so water often rather than deeply. The seeds should germinate in 2 to 3 weeks, but this will largely depend on the type of seed you are planting. Once the seed has germinated, maintain a consistent watering schedule, accounting for current weather conditions. Over-watering can cause grass disease problems, so it’s important to monitor soil saturation when maintaining your lawn. The best time to water your grass is between 4 a.m. and 6 a.m. If possible, you should avoid watering in the evening. What is the best practice for installing sod on a lawn? Professional landscapers often use a tractor fitted with a special sod-laying apparatus hitched to the rear. These attachments are then fitted with large spools of sod (which are backed with mesh). With this method, a worker holds one end of the sod strip while the tractor operator pulls forward, literally unrolling the spool of sod in strips. However, a tried-and-true DIY method is to purchase pallets sod, have the supplier deliver them to your home, and recruit all your friends to help on a Saturday morning. Have everyone lay the sod in tightly spaced rows, butted end to end without overlapping. Use hatchets to cut the squares to fit the property lines and around obstacles in the yard. If you have any gaps, fill with topsoil and add seed. Pay your friends with beer and pizza. What is the best practice for watering a new sod lawn? The key to establishing new sod is proper watering. Immediately after installing sod, water thoroughly making it spongy to the step. The new sod should be kept thoroughly wet to a depth of 4 to 6 inches and watered 3 to 5 times a day during the first two weeks, depending on the season. It is very important to keep the new sod damp in the first week so the grass can take root. (Lift a corner of the sod to determine the depth of moisture.) Avoid foot traffic on the lawn while it establishes. 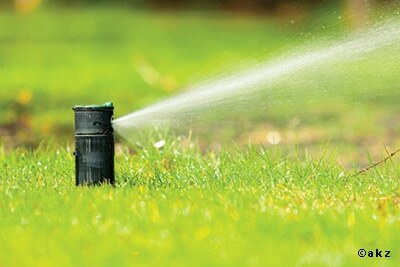 During hot weather, sprinklers should run several times a day so the new sod never dries out. If allowed to dry out, the sod will shrink, turn brown and might even die. At the end of week 2, dry up the yard enough so you can mow. Over the following two weeks, transition from frequent daily watering to fewer cycles per day. During week 3, reduce waterings to 1-3 times per day and skip a day between watering if the sod is not drying out. By week 4, water 1 to 2 times every other day. After week 4, your new yard should be ready to go 2 to 3 days between watering. Water your lawn in the evening or early morning when less evaporation occurs. New sod will need more water the first growing season and especially the first 6 months. As roots grow deeper over the course of a year, it will require less water. The key is deep watering less frequently, and to never let it dry out and brown. 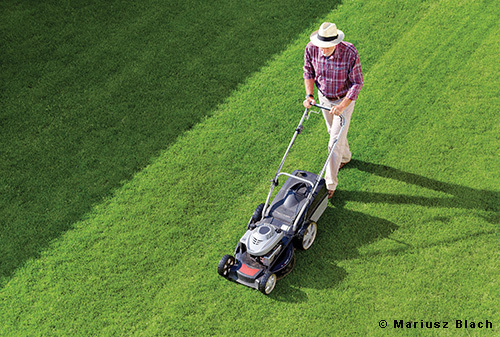 When I mow my lawn, how high or low should I cut the grass? When mowing, far too many people will set their mowers too low or “scalp” the lawn. This leads to thin and dying grass and shallow root systems. Each grass type has a height range that it prefers to be mowed to be healthier, look better and last through the season without dying out from lack of water. The depth of the root system is in direct correlation to the height you mow. So, the higher you mow, the deeper the roots, the more water the grass can get and the less you have to water. In general, two types of grasses are what we deal with. Cool Season grasses: Fescue, Bluegrass, Ryegrass. These are the most common in the Southeast. These grasses like to be mowed at a range of 2-1/2 to 3-1/2 inches high. Fescue looks best at least 3 inches high. Bluegrass is the most tolerant to lower mowing, but should still be left at least 2-1/2 inches. The other type is Warm Season grasses: Bermuda, Zoysia, Centipede. These grasses will tolerate as low a cutting as most homeowner’s mowers will cut. Golf courses use a lot of Bermuda and Zoysia, and they routinely cut it as low as 1/2 inch. A typical home lawn will look nice at 1 inch, providing you have a smooth grade. What type of herbicide is best to kill the weeds that are sprouting on my lawn? Post-emergent herbicides—the type you’ll need now that the weeds have already emerged—are categorized as selective or non-selective. Products such as Roundup are non-selective, meaning they try to kill most all plants, while a selective herbicide is designed to kill specific types of plants, like broadleaf weeds. Non-selective herbicides often kill all vegetation, destroying the nutrients in the soil and preventing any vegetation from surviving—including the grass that the chemical contacts. Certain selective herbicides may control broadleaf weeds in warm season turf grass, control of grassy weeds in Zoysia turf, etc. Products vary, so read the packaging carefully to a select the appropriate post-emergent herbicide for your specific application. Many grasses will naturally wake up and become green with the spring, but that’s not the case for bare spots, which require more care. 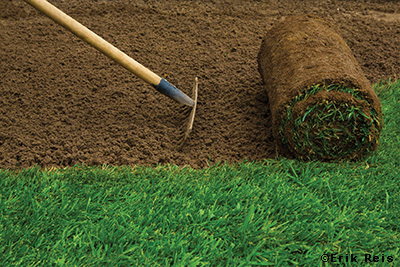 A tried-and-true method to jumpstart a healthy lawn is to aerate and over-seed the yard. Aeration fights thatch and soil compaction. Over time, built-up thatch and tightly packed soil can choke off nutrients from the grass. More than 3/4-inch of accumulated thatch can lead to lawn disease, insect infestation and ultimately drought. Soil compaction, due to traffic, rain and erosion, can do the same. An aerator is a machine that minimizes compaction by thinning the tightly packed soil while also removing built-up thatch. In lawn maintenance, aerating literally means “to supply with air;” it allows air, water and nutrients to enter the soil and nourish the lawn. Aeration should be done after the lawn has been mowed down to about 2 inches high. The most effective type of aerator is a “core” aerator, which uses hollow tines to remove “cores” or plugs of soil, leaving them laying on the lawn’s surface to return nutrients to the grass as they dissolve. 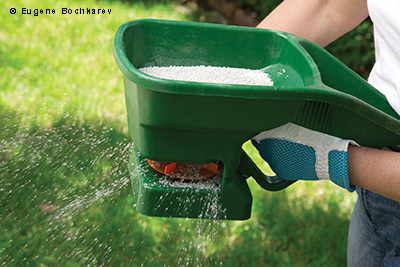 Many homeowner-type aerators use spikes that simply poke holes in the soil, but these types aren’t quite as efficient. 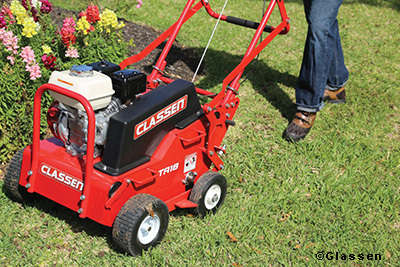 Some aerators are available as walk-behind or ride-on gas models, while other versions can be towed as an attachment behind a lawn tractor. Keep in mind that core aeration should only be done to correct problems of soil compaction and thatch buildup. It’s a great way to wake up an unkempt lawn at the first of spring, prior to fertilizing, but shouldn’t be a part of routine maintenance. For this reason, if you don’t want to invest money in the machine or store it during the off season, you should consider renting one. With a freshly aerated lawn, you’re ready to over-seed the turf. Make sure you’ve chosen seed that grows well in your area and matches the pre-existing lawn to avoid a patchy appearance. If you’re unsure, then inquire at a local garden center as to what works in your neck of the woods. What type of grass do I need for a “no mow” lawn? Certain grasses that are native to western regions of the U.S. can live on rainfall alone in their natural habitat and require mowing only a few times a year to keep a neat appearance. “No-mow” grass types include Pacific hair grass, fine fescue, buffalo grass and blue grama. Typical blade height is 2 to 6 inches high, and the blades grow sideways so the lawn shades itself and holds in moisture to withstand droughts. These types of grass offer inherent environmental benefits, resulting in fuel savings, fewer emissions from your lawnmower, no chemicals and less water usage. Several companies distribute the grass online, tailored toward the climate you live in. It can be planted from seed or from custom-grown plugs. How do I keep my lawn green in the winter? The EHT staff lives in Alabama, an area rife with St. Augustine, Centipede, Zoysia and Bermuda. These types of grass go dormant in the winter and turn an unbecoming yellowish brown. To solve this problem, some southern homeowners over-seed their lawns in early fall with a cold-season grass to keep the lawn green throughout the winter. When doing this, make sure to choose a cold-season grass that will die in the spring, such as Annual Ryegrass. Otherwise, when the warm-season grass awakens from dormancy, the two types will compete for nutrients.